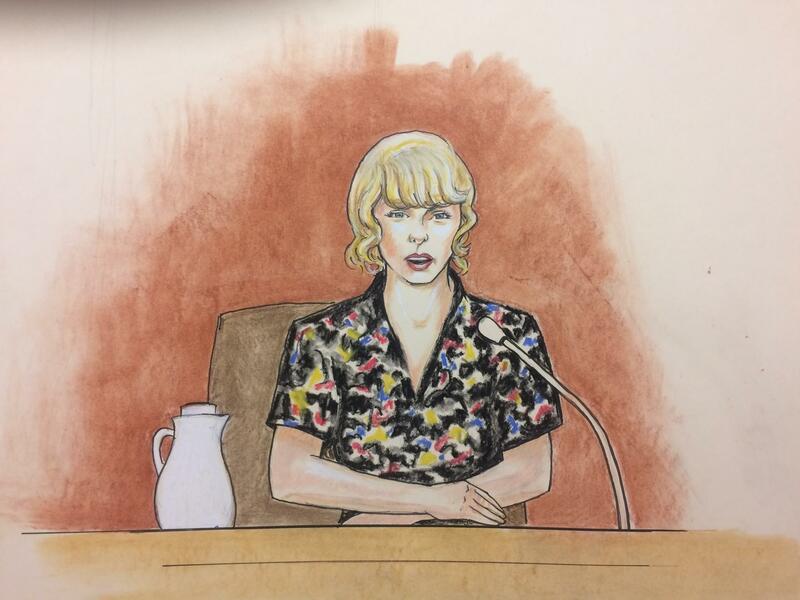 DENVER -- Jurors on Monday began deliberating over dueling lawsuits by Taylor Swift and a former radio host over her allegations that he groped her during a 2013 meet-and-greet. Attorneys for both sides pointed to a photo of the alleged assault as proof that it did or did not happen. A lawyer for the former radio DJ accused of groping Taylor Swift claimed that the singer's testimony was inconsistent with that of every other member of her team. As the pop star cried in federal court during closing arguments of her countersuit against former DJ David Mueller, Mueller's attorney questioned why Swift was smiling in a photo with the DJ if he reached under her skirt and grabbed her backside, as she has alleged. "Look at Ms. Swift's face. Is that the face of someone who's in shock, who is upset?" Gabriel McFarland, representing Mueller, said while showing the photograph from before a 2013 concert with Mueller and Swift together that Swift has said was taken the moment she he grabbed hear backside. Swift, who testified forcefully last week, cried and wiped her face as her mother, Andrea Swift, touched her right leg. Her lawyer also rubbed her back. Andrea Swift also touched her daughter's hand as McFarland said the photograph meant nothing. When the attorney suggested that Swift would not have kept her arm over Mueller's if he had grabbed her backside, Swift silently mouthed "wow." Swift's lawyer also pointed to Mueller's expression in the photo as proof. Without using the expletive, lawyer Douglas Baldridge said, "That is an S-eating smile right there." The photo was shown several times to jurors but has been sealed by the court. The civil trial came after Mueller sued Swift, her mother and the singer's former radio liaison Frank Bell, saying they got him fired from his job at a Denver country music station and seeking up to $3 million in compensation for his ruined career. He denies touching the pop star. U.S. District Judge William Martinez dismissed the claim against Swift on Friday, saying Mueller did not present enough evidence. The six-woman, two-man jury is still considering the claims against Andrea Swift and Bell. The judge also said the former DJ is only entitled to two years' worth of earnings - about $300,000 - if jurors side with him. Swift has countersued, alleging assault and seeking a symbolic $1 judgment. She said she wants to serve as an example to other women who have been assaulted. Jurors much reach a unanimous verdict on each claim. The singer's lawyer said during a closing argument that Mueller lost audio recordings he secretly took during a meeting with his bosses shortly after he was fired. Baldridge accused Mueller of changing his story and noted that his side never disclosed what the lost evidence was at trial. "The guy did it. Don't be fooled," he told jurors. McFarland told jurors that Swift's account of what happened is inconsistent with the testimony of every other member of her team. He also said Mueller immediately asked someone to call the police when he was confronted by security guards. "That's not the type of guy who grabs or gropes a superstar, apparently out of the blue," he said. He also cast doubt on the claim of former Swift security guard Greg Dent that he saw Mueller touch Swift while the photo was shot but did not act because he did not think she was in danger. McFarland said the photographer who took the image, Stephanie Simbeck, "started it all" by pulling the photo of Mueller, his then-girlfriend and Swift from dozens taken at the event and showing it to Swift, who identified Mueller as the person who touched her. Baldridge told jurors that Swift is standing up for all women and saying, "No means no." He characterized Mueller as an aggressor and asked jurors: "Will aggressors like David Mueller be allowed to victimize their victims?"